Drs. Brad and Jen, your Wantirna chiropractors, were recently appointed Associate Governors of the Australian Spinal Research Foundation. All Associate Governors act in an honorary capacity providing service to the profession. Drs. Brad and Jen are proud supporters of the Australian Spinal Research Foundation and regularly attend the foundation’s events throughout the year. In addition, our office holds a yearly event to raise funds for the foundation. 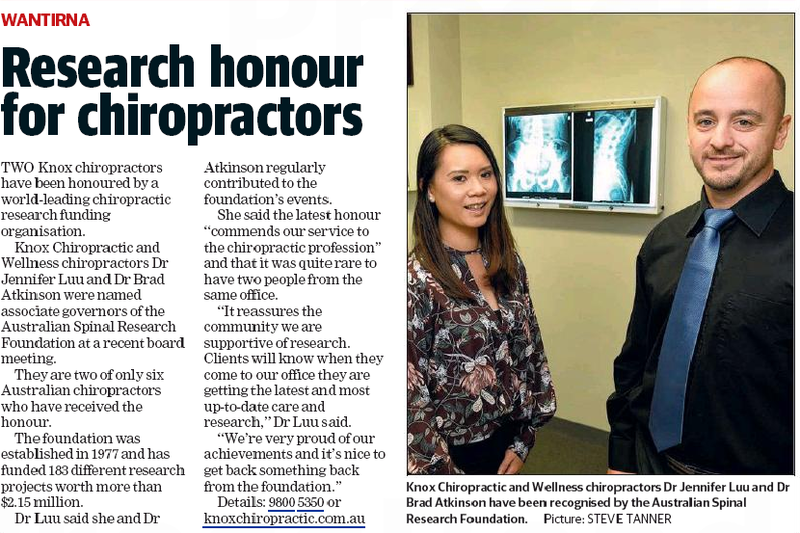 The Knox Leader (Issue May 23 2017) spoke to our two special chiropractors about why the Australian Spinal Research Foundation is important to Knox Chiropractic & Wellness and to Drs. Brad and Jen as chiropractors.